Rhythm and Stealth is a brooding onslaught of electronic wizardry. From the streetwise raps of Roots Manuva on ‘Dusted,’ to the Afrika Bambaata throwdown of ‘Afrika Shox’ to the spectral beauty of ‘Swords,’ this swan song from one of England’s techno supergroups is the final statement on ’90s electronica. 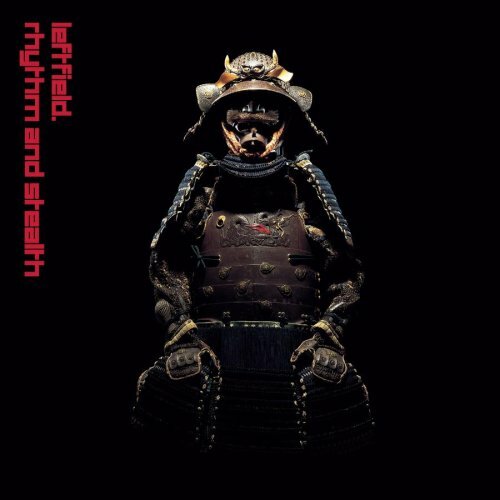 Unlike 1995′s Leftism, Leftfield‘s popular first album, 1999′s Rhythm and Stealth was jagged and austere in its first impressions. At its core was still Neil Barnes and Paul Daley’s unmistakable blend of thundering techno, dub science, hip hop beats, house rhythms and punk attitude. But their approach was now deeper in its studio precision, more beguiling in its sonic tricks, and in the end far more Detroit than Ibiza. Reference points of place and genre fail to convey the album’s true genius though, ranging from masterful experiments in the percussive warping of space-time to 21st Century songs that beam melodies through echo-prisms like zigzagging lasers. ‘Chant of a Poorman’ and ‘El Cid’ use reverbed drums and sharpshooting notes to excellent effect. Both drift in a sonic bayou, nocturnal dub submersed in shimmering tones and lit up by ricocheting, croaking zaps. Barnstormer ‘Afrika Shox’ takes a two-note bass pattern and reverses it, sucking it back up like a trap door, looping out to an assembly line of Zulu dreams. ‘Phat Planet’ is a metallic storm of funky change-ups and slapping high-hats that whip the air so hard they light the aural darkness like white torch blasts. When the track climaxes with a searing drum solo, the beat booms back in slightly after the downbeat with wicked inflection, resetting the vector points of polyrhythm. And closer ‘Rino’s Prayer’ rises to a simmering Mideastern wail, a little goodwill before the epochal upsets of the coming years between East and West. Sine waves build to a mountain peak, cymbal crashes bringing down the sky as Leftfield gently float us down to a gentle throb, pondering their last prescient prayer for peace. Leftism still gets the most kudos from critics and fans alike. It captured the heady days from 1993 to 1996 and was a chart success. But its sequel is Leftfield’s true masterpiece, a flawless, challenging work of art built to outsmart the march of time. Listen closely and you’ll be hooked, never quite able to crack its bewitching code.